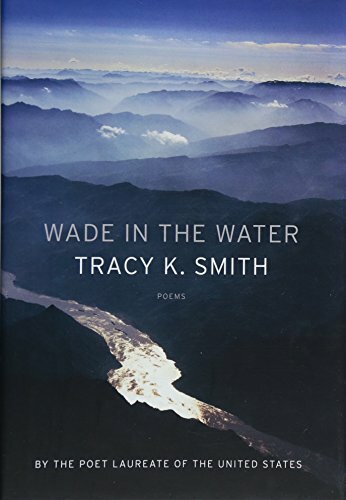 Like the spiritual, the poems of Wade in the Water speak to the longing and pain of a people familiar with oppression. Smith’s mother was a devoutly Christian woman, very religious in her practice. Smith’s father worked on Hubble space telescope. With one foot in the sciences, one foot in faith, and firmly rooted in the African-American experience, Smith’s poems expose a world of hurt and longing, a world of hope tempered by experience with regret. The woman who greeted her with “I love you” appeared to mean it. The speaker believed it. Yet it goes on to say that this greeting’s result was “a terrible new ache/Rolled over in my chest…she continued/Down the hall past other strangers,/Each feeling pierced suddenly/By pillars of heavy light.” Love, real love, unconditional, freely given love, warmly and openly gifted, yet opening a wound in the recipient who knows that the vulnerability love requires exposes a lifetime of hurt. Wade in the Water is separated into four sections. The first set (which include the titular poem) have a strong spiritual and cosmological bent to them. Poems titled “Garden of Eden,” “The Angels,” “Realm of Shades” hint at the deeper perspective. These poems talk about God, about “the holy,” about angels, not in a sense necessarily recognized (or likely approved) by any specific denomination, but more about the acknowledgment of a world beyond the visible. These are not church-lady poems, intended to celebrate faith or reinforce commitment. These poems acknowledge ugliness in this world and see God more as a curious but ultimately disinterested observer of the earth and the human condition, mildly appalled and disgusted sometimes but not involved or willing to participate in the squalor he sees. The second set are historically based “erasure poems.” These poems take historical American documents, including the Declaration of Independence and several letters from black Civil War soldiers and veterans, and “erase” parts of them to put them into poetic form. In some ways, these poems seemed to be the most personal. Highlighting phrases from Jefferson’s declaration gives them new visibility and power, and in this context reminds us that although those words speak eloquently to the plight of all oppressed peoples, they were written by a man who owned slaves and sold his own children borne by the slave he repeatedly raped. The third set is more contemporary and overtly political, giving voice to ongoing pain experienced by people today. “Unrest in Baton Rouge” opens with the powerful lines, “Our bodies run with ink dark blood./ Blood pools in the pavement’s seams.” “Watershed” looks like it may be a hybrid poem including erasures from DuPont Chemical memos and legal briefs, telling the effects of corporate indifference to the poisoning of people and animals by their products. I suspect the lawyers and corporate officials who wrote those messages did not realize how poetic or how prophetic their words would become. The final set seems more personal, including a beautiful tribute called “4 ½” to a child who reminds me of many other 4 ½ year olds I’ve met. Delightful, exasperating, whimsical and serious, this child clearly brings delight and mirth simply by being. These poems do not avoid broader themes, but they bring those themes home to the experience of the individual. Smith’s poems are beautiful. They reflect a world that is not always beautiful, that is often ugly and cruel and capricious and evil. The reflect a failure of institutions, of governments, of corporations, and of the supernatural to protect the defenseless. Indeed, far too often they oppress the very people they claim to serve. But in revealing these scars on our history and on our society, Smith gives voice and meaning to those who’ve endured them. Her topics may not be beautiful, but her poetry is. Wade in the Water troubles the waters, revealing depths in both the subject matter and the poet. I’ve never been to the Hugo Awards (or any other awards show), but this year I really wanted to watch them. I won’t pretend I have any real relationship with any of the authors. We have never met. But some of them have retweeted Scintilla, some have sent a “thank you,” and several have blessed us with their stories and novels. This year, watching the Hugos was not just another awards ceremony. It was a chance to see people I had glimpsed through their writing, people whose art I believe in, people who have become more special to me than I ever thought possible. So I watched not as a disinterested observer, but as a cheerleader. 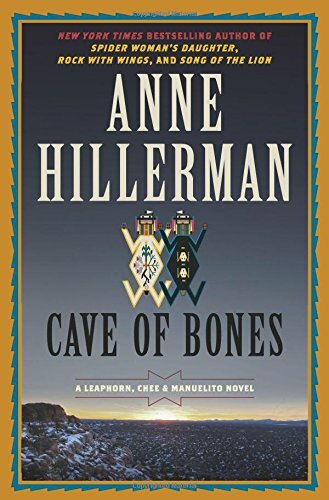 I loved the books by nominees for the John W. Campbell award for new authors: Rivers Solomon, Sarah Kuhn, and the winner, Rebecca Roanhorse (she also won for best short story, an AMAZING work called “Welcome to Your Authentic Indian Experience”). I look forward to reading those by other nominees. Nnedi Okorafor was up for two awards and won for Akata Witch, a YA novel that is beautiful and compelling. Nnedi Okorafor is actually one of the reasons I wanted to write about what I was reading: her Binti series and her young adult books moved me and I wanted to shout and dance and let the world know how amazing and special they were and I didn’t have an outlet until my brilliant wife said, “Hey, let’s create Scintilla.info” and now I get to shout and dance all over the keyboard. 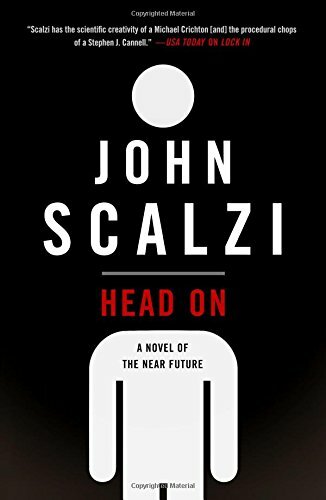 If you have read Scintilla at all, you have figured out that I am a big fan of John Scalzi. His book, The Collapsing Empire was up for best novel. It didn’t win, but I am not disappointed. The winner, for the third year in a row, was the incomparable N.K. Jemison. Someday I will review her books, because she is incredible. As gifted a writer as she is, though, her acceptance speech was powerful and passionate and gut-wrenching because of its raw honesty. 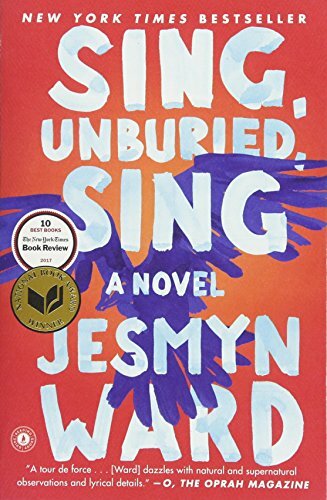 Her first novel was rejected because “only black people” would want to read a novel by a black writer. That sickened me. I hate to think that we are that shallow, that we can only enjoy writers who are “like” us. I am white, straight, cis male, middle-aged, and its fair to say I have my pick of writers who are “like” me. And some of them I like. Some of them. But what I love are writers who show me new perspectives, who invite me into their worlds and allow me to look through their eyes. My heart is affected by writers who are willing to say, “walk with me and talk with me and see things with me and listen to my stories” and when I shut up and listen and walk and look I can recognize that this is a big beautiful world full of stories, some sad and some ugly and some tragic and some appalling but all of them full of beautiful lovely people. Some of those people were at the Hugos. Some of them won. But because they are telling their stories, all of us willing to listen and to read and to care are better. 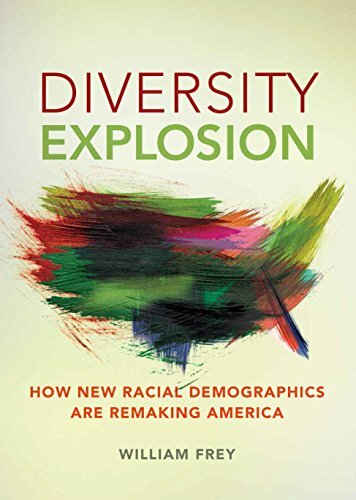 Diversity Explosion was written in 2014, and in just four years it is fascinating to see both how prescient the book is and how premature some of its optimism appears. Much of the book is fairly straightforward demographic analysis. There is nothing particularly groundbreaking in noting that immigration and birth patterns show growth in minority populations and decline in white populations. Indeed, June 2018 headlines noted that a majority of states now have more white deaths than births. That this trend now reflects a majority of states was news, but only in the sense of “it’s here.” Anyone paying attention to demographics and statistics knew it was coming a long time ago. What does stand out in the book is its optimistic tone. Frey believes that the growing diversity of America is a positive trend for the future of our country. He sees trends in many places showing less segregation, more intermarriage, better economic prospects for minority and immigrant populations, and extrapolates that this could mean less racial tension, more integration, and overall improvement in race relations in America. I want to believe him. I really, really do. I agree with much of what he says. Having lived in New York City, Denver, and Los Angeles, I am familiar with communities that are very diverse, even “majority-minority” populations. I love it. The best Thai food I’ve ever had was a few miles from the Buddhist temple in Sun Valley, CA (part of LA). I was asked to sing with a Filipino choir that practiced in Orange County, CA (thanks to my own interracial marriage to a New Yorker with Filipino parents). The first marriage I performed as a pastor was between a Nicaraguan immigrant (Hispanic) and an African-American. Our country is enriched by immigrants. My own DNA is (by family tradition, not by testing) a mixed bag of European countries, possibly with a seasoning of Native American. I want to think that my multiracial children will live in a country where they are judged by the “content of the character” and not by their skin tones or their facial features. I want to believe that my grandchildren will be proud that their grandparents defied convention of their time and married “out.” I want to believe that my friends who are black and brown and white live in a country that honors their contributions, celebrates their heritage, and appreciates their status. The current political situation, though, gives me great pause. I thought I would never be prouder of my country than I was in 2008 when we elected Barack Obama: a mixed-race man who was raised for awhile in Asia! I was wrong–I was prouder still when he was reelected in 2012. I allowed myself to believe that the immigrant-friendly, racially-open country Frey foresees in this book was actually the country I lived in. After their loss in 2008, Republicans did an intensive self-reflective study that concluded their rhetoric and their policies turned off people of color, particularly immigrants. The study urged their politicians to chart a new course, evaluate areas of commonality between Republican positions and values espoused by different ethnicities, compromise or even change positions in areas that were not core Republican tenets to reach out and broaden their base. Their conclusion was that if Republicans failed to become a more inclusive party, they would be left behind by the demographic changes that were transforming America. It remains to be seen whether the anti-immigrant, racially divisive governance of the current administration is a brief anomaly or marks the beginning of a much darker time in US politics. Diversity Explosion shows us what America is becoming. Closing the borders may delay the inevitable, but demography will win. Our country is changing, like it or not. Diversity Explosion takes a very hopeful point of view, that these changes will empower our country and her citizens, and that we will all be richer for participating in this transformation. I fully agree with this view. I only hope that those who disagree will read this book and reflect on its perspective. Most little kids love dinosaurs. I know I did. I read about them. I had dinosaur toys. I had posters in my bedroom, one showing a timeline of the Mesozoic: Triassic to Jurassic to Cretaceous and the dinosaurs that lived during each era. (I might have been a nerd.) Now, The Rise and Fall of the Dinosaurs by Steve Brusatte has rekindled that childhood amazement with these creatures of long ago. Brusatte’s book reads almost like a novel, with exciting characters (both human and saurian) and plot twists galore. Although the ending is predictable–spoiler: the dinosaurs do still die in the fallout from an asteroid collision–the journey is fun and fascinating. Well written, exciting, and interesting, this is a book for any dinosaur fan from precocious tween to those of us who risk being called “dinosaurs” ourselves. Brusatte has collected fossils, stories, and friends from all over the world. The Rise and Fall of the Dinosaurs starts in China, where he was invited by a friend to examine a newly discovered fossil of a dinosaur with a feature long suspected but difficult to find. He writes about trying to find his way through Beijing, finding the right train despite not reading Chinese, traveling with his Chinese friend/colleague through the country to Jinzhou, and arriving at the site where the fossil awaited their inspection. And before we have met a single dinosaur, before we have been introduced to any exotic terminology, we realize we are on an adventure with someone who loves what he does! I’m just going to say it: this guy digs fossils. Dad jokes aside, Brusatte and his fellow paleontologists are a huge part of this story. 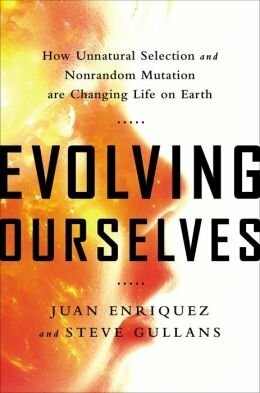 From the Bone Wars of the 1800s, where not-so-high-minded ivy-league professors hired people to dig up fossils in the western US (and mess with the digs and fossils of their rivals), to current scholars who get cool nicknames like “the rat pack” and who have sometimes colorful back stories. I am not sure how learning to “deseminate” and inseminate pigs prepared someone for a career in paleontology, but it probably makes for some rather earthy stories around campfires! Brusatte writes with affection and respect for these people whose love for dinosaurs sends them digging in far off and difficult areas, sometimes at personal risk. Crossing a river on a broken foot to get to an exposed fossil sounds incredibly painful, but it’s just one of the many things these women and men do to advance the science of these ancient creatures. And the science is advancing. The fossil in the opening chapter, the one Brusatte traveled to Jinzhou, China, to see? It was a dinosaur preserved with clear impressions in the stone of feathers! Several more fossils have been discovered showing feathered dinosaurs, showing that dinosaurs are still among us. They no longer dwarf school buses, they no longer have teeth the size of a man’s arm (or actually have teeth at all), but birds are the living legacy of T-Rex and triceratops and all the other residents of the real Jurassic world. Science also shows that many of the attributes we see in modern birds began with their ancient forebears. Rapid growth, the kind many birds still experience, explains how a brontosaurus could go from an egg to a 40-ton behemoth in the span of a single lifetime. Light but strong bones explain how those giants could move, and air pockets within the bones explain how heat could be dispelled by creatures of that size. These are traits common in birds today and seen within the bones of fossilized dinosaurs. Other research is exploring what colors dinosaurs were, based on microscopic analysis of their fossils! Apparently, individual cells can not only be fossilized, but pigment cells come in different shapes, and those shapes can reveal secrets about color. Computer analysis today is showing how dinosaurs moved, how fast they ran, even modeling behaviors such as likelihood of pack hunting. If T-Rex was not terrifying before, consider that the newest research indicates that it hunted in packs! And, yes, it had depth perception, so the Jurassic Park movie trick of standing very still might have made you a less interesting snack, but would not have protected you. 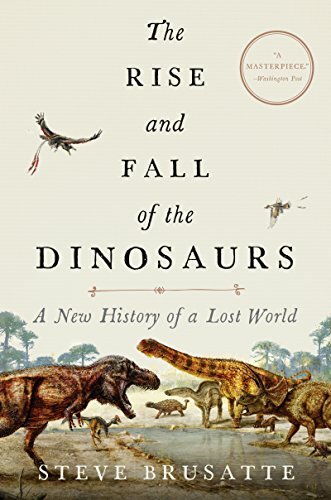 The Rise and Fall of the Dinosaurs is a beautifully written, excitingly told book about an endlessly fascinating subject. It does not make me want to live in a world with dinosaurs–they would eat me, quickly and painfully. But it does make me want to visit a museum again and marvel at the clues they left behind of their lives. If you enjoy science writing at its best, if you are or know a fan of dinosaurs, or if you want to encourage someone to see how exciting research (and researchers) can be, this book makes a great addition to your library or a great gift to someone else. 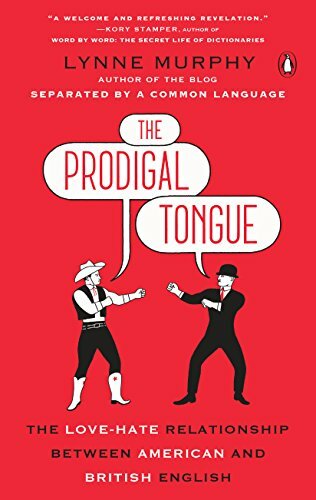 The Prodigal Tongue is one of the funniest books I have read in a long, long time! Lynne Murphy writes with her own (prodigal?) tongue planted firmly in cheek, or does she write with a cheeky style? Regardless, NOT irregardless!, read this book prepared to laugh. I recommend you not read it while lying next to your loved one in bed, as you will disturb her sleep by laughing aloud or immediately reading aloud a paragraph. Or more. You might read more than just a paragraph. Trust me, and learn from my errors. Murphy stands firm in her defense of American English as being a legitimate heir to the English of Chaucer and Shakespeare. This is not to rate American English as better than “English English,” but neither is it worse. Despite the naysayers and pooh-poohers who scoff at the sundry sins and crimes committed (they say) by Americans every time we open our mouths, Murphy refuses to back down. England is welcome to her “colours” and her “labours” and her “-ise” endings on words that sound like “-ize” and “-ice.” American colors are just as crisp and our labors are just as strong and our language is not inferior to that spoken on the airwaves of the BBC. So have some apple pie and watch some baseball and call your mum. I mean, your mom. Lynne Murphy has got our linguistic backs. Don’t let the fun and the funny in the book or this review fool you, though. The Prodigal Tongue is deeply researched and very well argued. Etymology and logic guide the rhetoric. Murphy’s task is made much harder by the misinformation about the two expressions of English, misinformation fed by an often gullible press. Many UK commentators express worry about the “Americanisms” that are invading “their” language. Many of their concerns are poppycock. Often, the words they use as examples of this are words that actually originated in the UK (or, less often, in Australia or another of the many countries speaking English today). The “American” penchant for removing “u” from “-our” words (colo/u/r, labo/u/r, etc.) actually began in England and migrated across the pond. American dictionaries adopted the practice, while their British counterparts reversed course. There are certainly differences in idiom, spelling, and usage between the US and the UK. Just as profound, if not more so, are the differences within each country. Texas and Maine are further apart geographically than Scotland and Wales, but linguistically the differences are just as striking. This is more noticeable in spoken language than in written, which is true for both countries. Differences and distinctions are not errors, nor do they indicate less intelligence, education, character, or any other lack of virtue by others. Murphy calls us to celebrate the richness of a language that can accept, adapt, adopt, and become indeed a lingua franca–a phrase unironically used on both sides of the ocean to now describe English. Murphy’s prime mission is to remind all of us blessed with this rich linguistic heritage that it is, still, a common language. We may not all carry a bumbershoot onto the lift, but we can all fix a flat. Of course, “bumbershoot” is actually an American word, and whether the flat is your car tire (tyre?) or your apartment will affect whether you need a lift or an elevator, but those are small matters. Note: I have corrected Dr. Murphy’s employer in this review. An earlier posted version of this review had her at the wrong university. She is at the University of Sussex. My thanks to Lynne Murphy for correcting my mistake.